Setting a wedding date just four days before Christmas, Michelle and James chose Curradine Barns for their festive celebration. With a traditional Christmas colour scheme, a fabulous tree and beautiful lighting, it was a magical occasion. 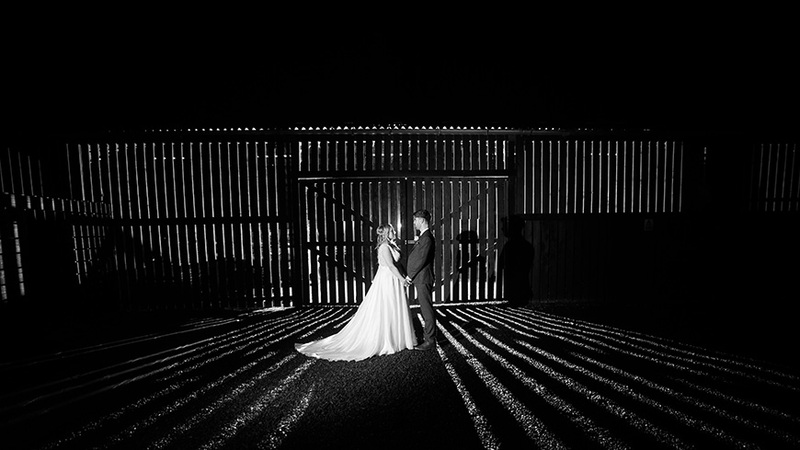 Searching for the perfect barn wedding venue in Worcestershire, Michelle and James fell in love with Curradine Barns as soon as they saw it. 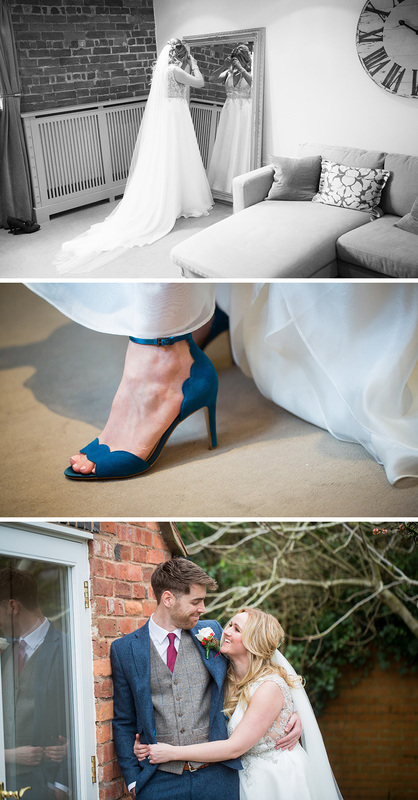 They fell for the rustic style, the size of the venue and the fact that all three areas flowed perfectly together. Marrying just four days before Christmas, the happy couple wanted Curradine Barns to look festive so adorned the venue in fairy lights and candles. 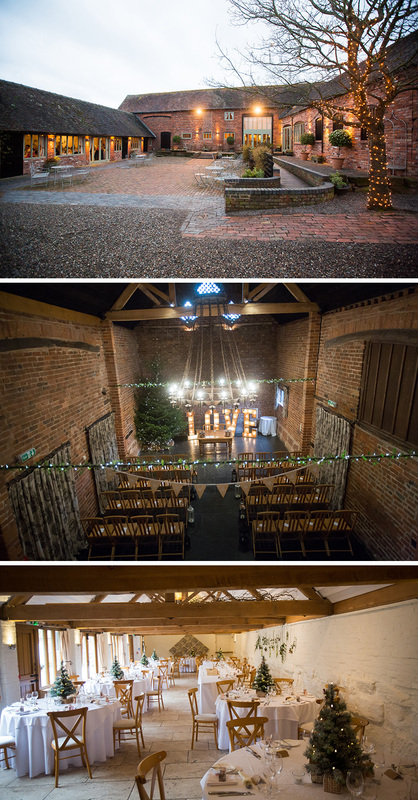 Lanterns lined the aisle in the Granary Barn and a 20-foot tall Christmas tree was decorated with white fairy lights. Single stem roses looked beautiful in the Barley Barn and each table featured a small Christmas tree in the centre with wrapped presents in vintage themed paper. 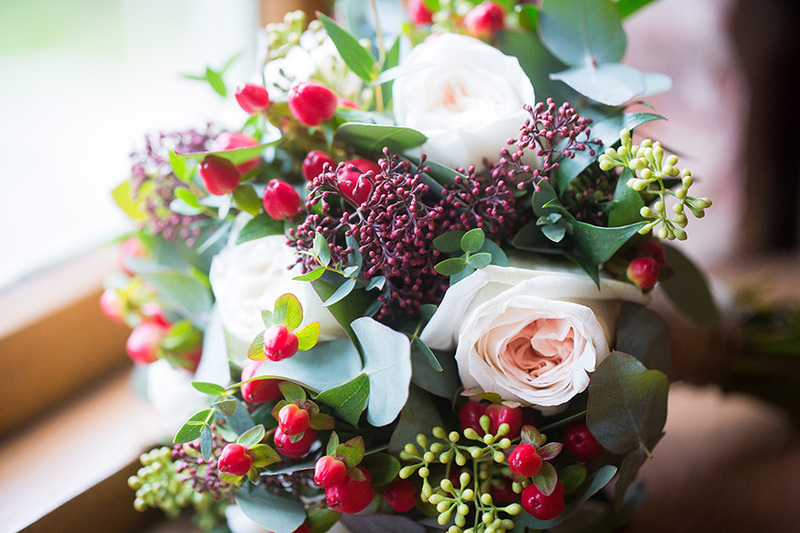 White roses, eucalyptus and red berries were the perfect festive choice for the bouquets. The beautiful bride chose ‘Lacrecia’ by Sottero and Midgley, a stunning backless gown with embellishment and a long train. She accessorised with blue Karen Millen shoes, diamond stud earrings and a bracelet that matched the beading on her dress. Meanwhile, Michelle’s three bridesmaids wore silver wrap dresses by Alice Temperley with maroon shoes from Zara. James looked the part in a navy blue wool suit from Peter Posh, accessorising with a tweed waistcoat, maroon tie and pocket square. 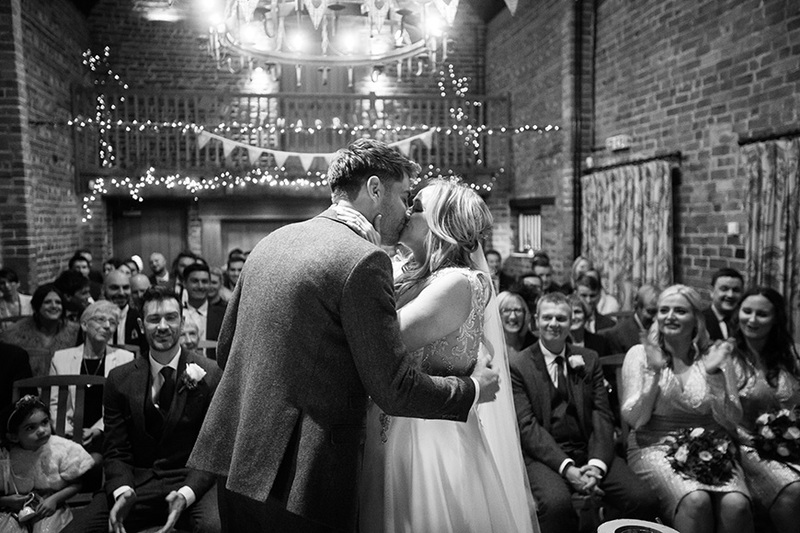 Following their romantic ceremony, a drinks reception took place in the bar, with guests wandering out in to the Courtyard on a surprisingly warm December day. Their winter wedding breakfast started with a Scotch egg, moving on to a lamb main course and a trio of delicious desserts. As day turned to evening, a DJ got the party started and the newlyweds danced their first dance to ‘Guava Jelly’ by Johnny Nash. Locally sourced sausage rolls and pasties proved a hit for the evening food and the dance floor filled!